Featuring a variety of birthday cakes, finger foods to serve at a baby or bridal shower, and re-creations of backyard barbecue standards like peach cobbler and corn bread, Danielle includes all of the classics. There's a full Thanksgiving spread--complete with turkey and stuffing, creamy green bean casserole, and pies--and menus for Christmas dinner; a New Year's Eve cocktail party and Easter brunch are covered, along with suggestions for beverages and cocktails and the all-important desserts. Recipes can be mixed and matched among the various occasions, and many of the dishes are simple enough for everyday cooking. Stunning full-color photographs of every dish make browsing the pages as delightful as cooking the recipes, and beautiful party images provide approachable and creative entertaining ideas. Making recipes using unfamiliar ingredients can cause anxiety, and while trying a new menu on a regular weeknight leaves some room for error, the meal simply cannot fail when you have a table full of guests celebrating a special occasion. 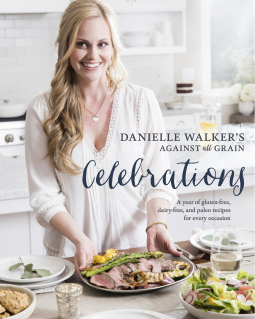 Danielle has transformed her most cherished family traditions into trustworthy recipes you can feel confident serving, whether you're hosting a special guest with food allergies, or cooking for a crowd of regular grain-eaters. While I have a number of Danielle Walker's cookbooks they are all in the physical form. I wasn't sure with the nature of cookbooks whether they lend themselves well to the ebook format. Hence my curiosity when I requested this from netgalley, I was also anxious to get my hands on this one, Danielle Walker is a favorite of mine. Rather than use my kindle, I downloaded on my iPad and it worked very nicely. I could jump back and forth between pages with ease, never losing my spots and the photos throughout were displayed nicely. Like I stated above the author is not new to me, I have a couple of her other cookbooks and I was anxious to get my hands on this one. I was not disappointed here. Following the author on Facebook I knew of her passion in the kitchen and this paleo lifestyle. Reading of the work that goes into her recipes makes me appreciate her recipes all the more. This cookbook begins with chapters on the different ingredients that she uses. She explains the benefits, what works better with different foods and even includes links where they can be purchased. As for the the recipes themselves, I was happy with the layout and variety of dishes. I didn't try them all out, but the ones I did where really good. Even those in the family not following this way of eating enjoyed them. Some of my favorites include - roasted beet and bacon salad, poached cod (with butternut squash and carrot puree - perfect for this time of year) and meyer lemon curd cakes. Definitely a cookbook I highly recommend to those following a healthy diet. Thank you to Ten Speed Press and netgalley for an advanced copy.